To celebrate National Voter Registration Day, Twitter has announced a new feature that makes it it easier than ever for US residents to register to vote in the presidential election. 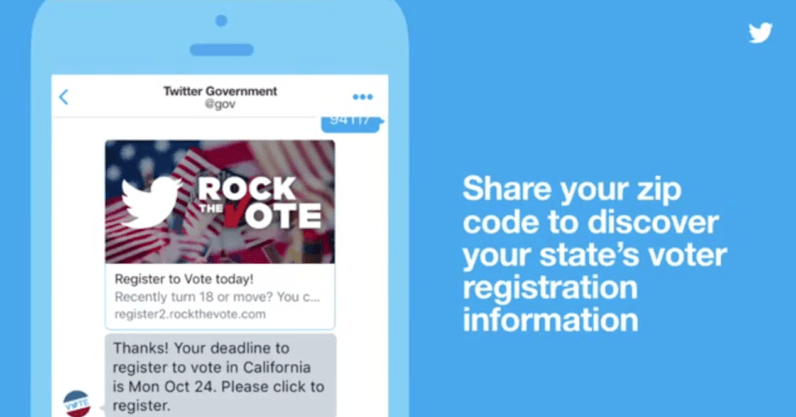 Starting today, when a Twitter user sends a Direct Message to the official @Gov account with their five-digit zip code, they’ll receive an automated response with their state’s voter registration deadline and a personalized link to register. If you’ve already registered to vote, be sure to let your friends know by sending out a tweet with the hashtag #iRegistered. This generates a neat little emoji — pictured below — which, when pressed, redirects users to a page where they can register.